I can remember something my father told me long ago. Once you make a true friend, they are a friend for life. No matter how often you see them, or talk to them, they are still and always will be your friend. I think this sums up the annual Dave Matthews Band Summer tour. There is a connection with the audience, that much is obvious. 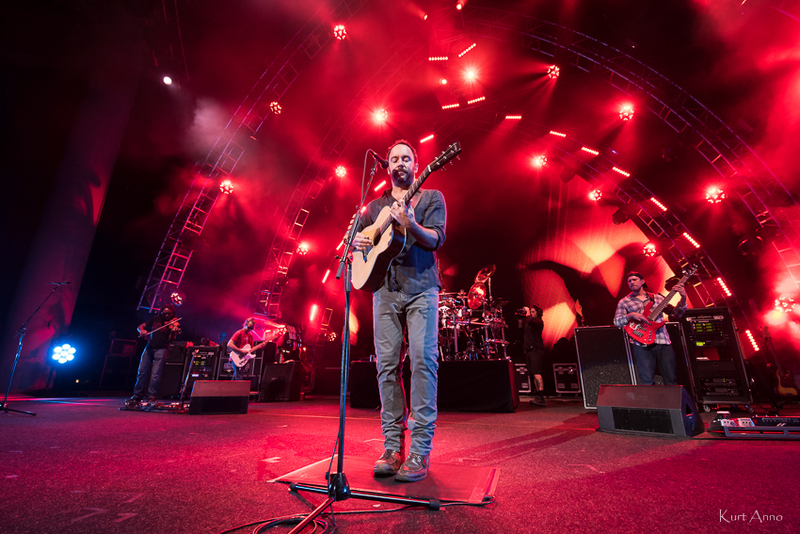 Even for the newcomer to DMB, the lengthy jams and way that the songs are played differently each time resonates strongly with all fans. It is in many ways like seeing an old friend again. I get the feeling that the audience is possessive of DMB. Feeling like the band is their’s and their’s alone. There is such a connection between band and fans that even as an observer, it is very obvious. The loyal following is not unlike that of the Grateful Dead, Phish or Jimmy Buffet in many ways. These folks camp, listen, dance, and are always treated to highly polished and talented musicians night after night, show after show. This has been going on for better than twenty years. As per usual, Dave started off with the first of two sets as strong thunderstorms were just off to the south of Klipsch Music Center and on the edge of being a real concern. With lightning providing the backdrop as the sun began to dip, the acoustic set began with Rye Whiskey, a cover of a Tex Ritter song. Other notable tunes in the acoustic set were Spoon, Bartender, One Sweet World and rounded out with What Would You say. After a short 20 minute break, the stage was reconfigured and thus brought in the electric set which began with Stay (Wasting Time). That was followed by #41 and Don’t Drink The Water. As most DMB shows, the crowd is always treated to a rousing cover song. On this Friday night, the now raucous crowd was treated to Peter Gabriel’s Sledgehammer. DMB ended the set with Jimi Thing which brought down the house. Not done yet, DMB performed a lengthy encore of So Much To Say, Anyone Seen The Bridge, Too Much, Ants Marching and Halloween. This was my first ever time seeing Dave and I pretty much knew what to expect. I wasn’t disappointed. I have been a listener for many years and I now consider myself a real fan. I really enjoyed the vibe put out by this talented group of musicians and I liked the vibe the audience returned to the band. I am now looking ahead to next summer’s shows.